The next couple of nights are going to be chilly for this time of year, with most of the country falling below 10C tonight and some spots seeing temperatures as low as 5C. Fortunately temperatures return to normal for New Year’s Eve. “The good news is our forecasters are picking a dry and sunny day to end the year for the North Island, perfect for hanging out at Rhythm and Vines in Gisborne,” said meteorologist Emma Blades. “In addition, north-westerly winds are forecast to pick up on Saturday evening for Wellington, so do check the latest forecast if you’re planning any New Year’s fireworks,” said Ms Blades. 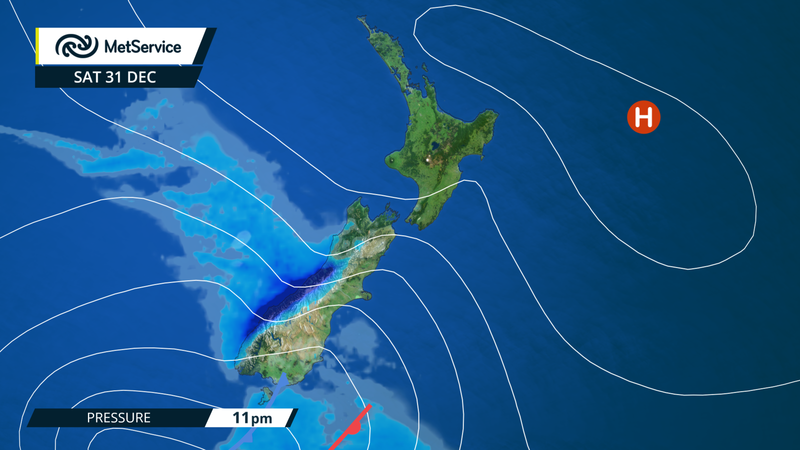 It’s looking wet for the west and south of the South Island over the weekend. The east is looking dryer, with just a few spots of rain likely – and with a strong, northwest foehn wind forecast for Canterbury, temperatures there could reach the low thirties on Sunday. Some areas are harder to pick. “Currently it looks like Queenstown and Wanaka will dry out in time for midnight celebrations on Saturday, but with a couple of days to go the timing of the wet weather could change, so it’d be wise to check in on the latest forecast if you’re planning on being outdoors to see in 2017,” concluded Ms Blades.